Okay, I am overstating this…a bit. The sale, listed as an “Estate Sale Hoarders House,” was indeed jammed with stuff, but also in true hoarder fashion was jammed with dust, must, dirt and mildew. Yes, there was a certain “ick” factor. Nevertheless, I had a feeling there were vintage treasures to be found. And there were! 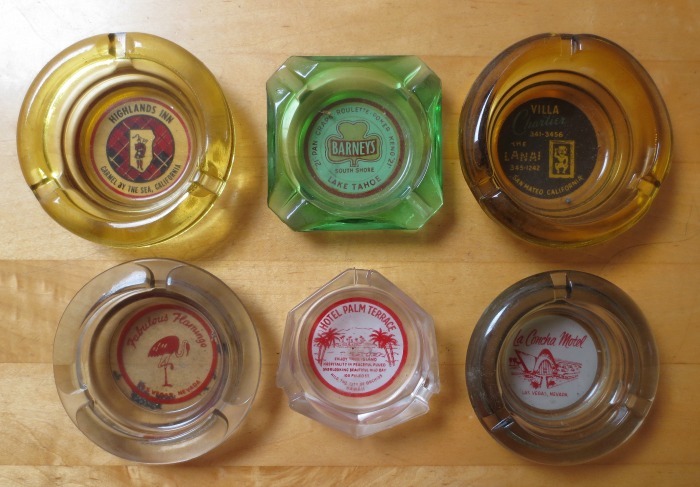 One of my favorite finds was a collection of vintage (all-be-it grimy) glass ashtrays. (Nothing a soak in soap and water won’t fix.) These were tucked away in a plastic bin on a shelf in a bedroom. One of the ashtrays is from La Concha Motel, Las Vegas, which opened in 1961 and closed in 2003. Another from Barney’s, Lake Tahoe, which also opened in 1961, became Bill’s Casino in 1987 and closed in 2010. They are all in great condition. I also found a fun photo album with 1960s pictures from trips to New Orleans, San Antonio, Washington, DC, Las Vegas, Reno, Salt Lake City and the Grand Canyon. I was enchanted. I spotted a couple of paintings that I thought were kinda cool. 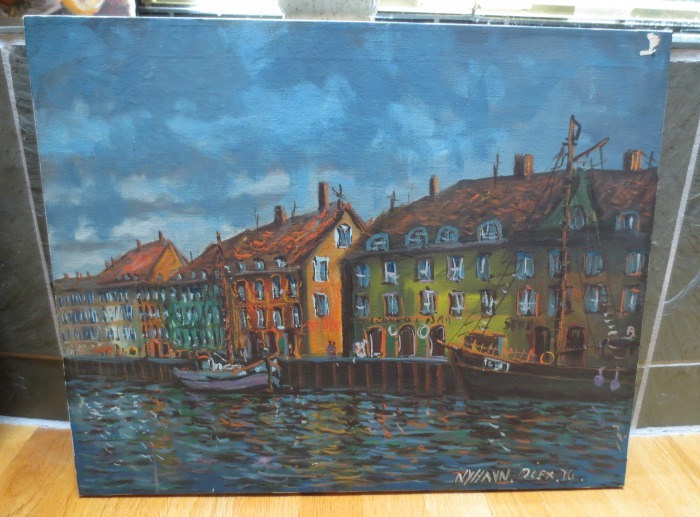 One is of Nyhavn, Copenhagen, Denmark. It has a bit of a sticker in the upper right corner that I need to carefully tease off. It’s signed Alex and dated (’70 or ’76). 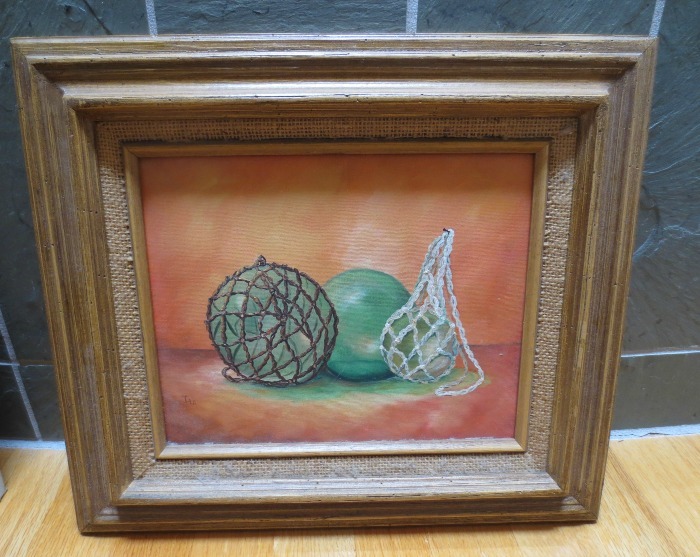 The other is a small painting of fishing floats. The colors and framing look very ‘60s/’70s to me. 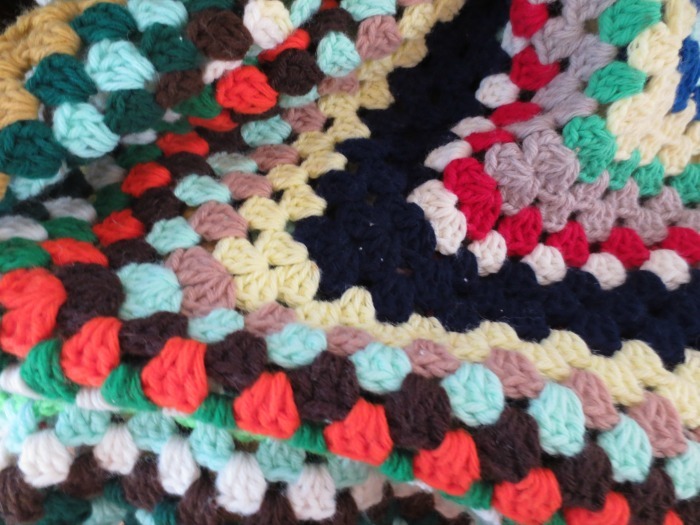 I also grabbed this colorful granny-square afghan. (I’m a sucker for hand-made afghans.) It’s lovely, but stinky! I’m going to wash it before I list it. I also bought a vintage ceramic and wood lamp. It was rather hidden by other stuff on the night stand and the shade (which may not be original anyway) was shot to bits (and of course stinky), but I liked the lamp’s style. Alas after I got it home I discovered the plug was also shot to bits and frankly a fire hazard, but I think it’s a fairly easy fix. This lamp feels solidly 1960s Danish to me. In fact, I found the same lamp on eBay listed as “midcentury modern Danish.” Well, there you go. Despite the close quarters and the dirt and dust, I found a lot of great things (this is just a sampling) and ended up enjoying myself immensely. After I got home I started wondering about the previous owner of this house and did a little online sleuthing. Turns out the house belonged to Mary B., age 82, who died this past April. She was a single gal who worked as a senior computer programmer until her retirement. 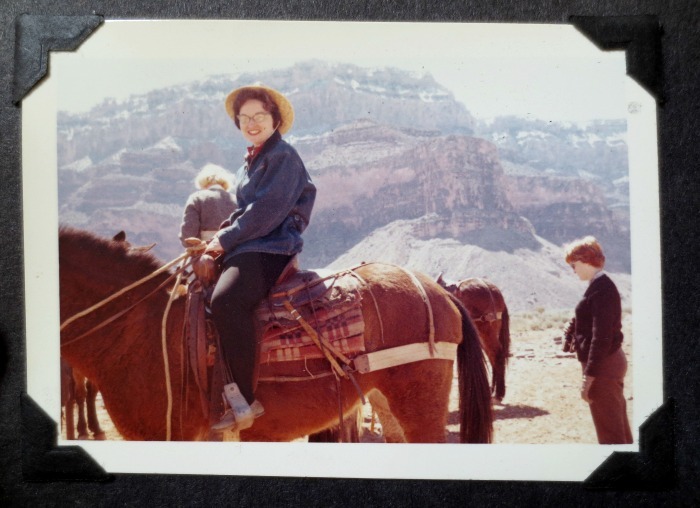 She loved traveling, camping, skiing and reading. I’m trying to reconcile this info (and her spunky obit photo) with a woman who lived in a dirty, hoarded house and it doesn’t add up. But I imagine retirement probably hit her hard, and as she aged, maybe she could no longer do the activities she wanted to so she resorted to buying things. Lots and lots of things. Well, Mary I shall endeavor to find good homes for your bits and bobs, but some of your photos (perhaps of you!) I’m keeping for myself! Been to any interesting estate sales lately?? I went one a few weeks ago. I didn’t even think to take a picture of what I bought. I gave it to a friend as a gift. It was a crystal dish like a sugar bowl but had a gridlike wire cover for arranging flowers in it. Thanks! Nope. We move too much so I don’t buy much anymore.